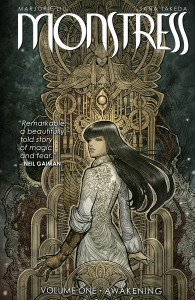 Monstress is the critically acclaimed steampunk fantasy comic created by writer, Marjorie Liu and artist, Sana Takeda. Kyle Willoughby and Claire White have been eager to check out this story since they saw Takeda at New York Comic Con last year. Claire connects the events of the comic to the second Sino-Japanese War and those it impacted, like Liu’s grandmother. Kyle continues the conversation with more on Marjorie Liu’s process and her special cross-continental collaboration with Sana Takeda. Our hosts conclude with their thoughts on the comic, its portryal of such dark subject matter, and the brilliance of its illustrations.